by Rod Dew, The Press September 6, 1995. Only days ago, the mastermind behind the internationally successful Britten V-twin racing motorcycles, property manager and engineer extraordinary John Britten, was working on the design of a world-beating superbike to herald the return of the once famous Indian marque. His approach was typical, totally focused and positive, pushing aside the illness which was threatening his life. Although his untimely death yesterday will have a profound effect on the ambitious $100 million Indian project being backed by an international consortium, the effects of his passing will be felt just as sharply in many other quarters. Mr Britten, who was 45, suffered from cancer. One of his greatest triumphs was last month when New Zealand rider Andrew Stroud won the world individual BEARS championship on one of the technically advanced New Zealand-made Britten racers. 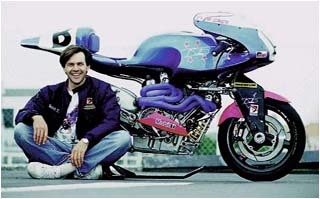 An other New Zealander, Stephen Briggs, claimed second place in the world-wide series on an Italian-owned Britten to underline the dominance of the modest Christchurch Britten Motorcycle Company, which easily won the world manufacturers' championship. The owner and director of a Christchurch property and man agement company, Brittco Management Ltd, Mr Britten was widely regarded as a shrewd but decent businessman with a rare ability to transform dreams into reality, a visionary with the handyman touch. He was reserved, almost self-effacing. In earlier times, he was known for his work with glass, and he could list hang gliding and historic motorcycle racing among his many interests. Although he made his international mark as the designer of motorcycles, flight fascinated him. He studied the flying action of birds with the plan of building an ornithopter (a machine driven by wing action). When he was in his 20s, he built a 24ft glider that could lift a man in a 10kmh wind. Other ideas swirling around in his ever-active mind included a lightweight commuter car made of wood and a carbon fibre pedal bike. A single-cylinder four-stroke utility engine is already at the testing stage. The wonder of it all was that he accomplished so much despite having to overcome a reading disability, which held him back while he was a student at St Andrew's College. He gained a New Zealand Certificate in Engineering at polytech and later withdrew to a farmhouse at Teddington, baking bread and practising yoga. In between designing motor cycles, John Britten provided the inspiration for the extension of Christchurch's historic tramway east of Cathedral Square and through New Regent Street. His far-sighted plan to run the tramway through a proposed $4 million shopping precinct, "Cathedral Junction," from Gloucester Street to Worcester Street on the site of the old Calder McKay building, which his company owned, caught the public imagination. Mr Britten's company also bought the old Cinerama Theatre in Worcester Street with the object of restoring it and incorporating it in the "Cathedral Junction" project. Earlier, he was responsible for the development of the upmarket Heatherlea apartment building opposite Hagley Park. On the sporting front, Mr Britten will be remembered for his incredible success with his motor cycles, built on a shoestring budget in his tiny factory in Christchurch. He once said of his racing: "This is my hobby; not my living. I am totally under capitalised." In spite of this, the bikes he designed and built in Christchurch have won both the prestigious "Battle of the Twins" race at Daytona and the famous international race for twin-cylinder machines at Assen in Holland. Mr Britten's bikes have set four world speed records in ordinary race trim, and hold the outright speed record for Daytona. The world flying mile record (302.82kmh), the world standing quarter-mile (10.759sec, 134.617kmh), the world standing kilometre (19.33sec, 186.245kmh), and the world standing mile (27.135sec, 213.512kmh), were all set on the South Eyre Road. Last summer, Mr Britten achieved a long-standing ambition, winning the New Zealand superbike road racing champion ship series with a bike designed and made in New Zealand. Mr Britten achieved international praise for his non-traditional methods of construction, and use of carbon fibre. The Britten bike has no frame. The swinging arm, fork, shocks and radiator-subframe all bolt directly on to the engine. The wheels, bodywork, swinging arm and fork girders are all of carbon fibre. Earlier this year, in recognition of his contribution to engineering, Mr Britten became only the eighth person to be elected an honorary fellow of the Institute of Professional Engineers of New Zealand.